Under globalization, small and medium enterprises (SMEs) that predominate Taiwan’s economy have been primarily original equipment manufacturers (OEMs) continuing to adjust operating strategies in order to extend supply chains and enhance competitiveness. This paper adopts the big data composed of 104,377 Taiwanese manufacturers from the 2011 Industry, Commerce, and Service Census to assess impact of the business life cycle, brand revenue, R&D spending, and internationalization on value creation. Major findings are as follows. First, the link of the firm’s operating years with value creation is characterized by a quadratic U-shaped curve where the minimum point corresponds to 15 years of operation, suggesting a cost of lower value added for new ventures at the early stage of development. Second, a reversed U-shaped curve of value creation is found as regards brand revenue and R&D spending, with the greater impact of the latter. Third, the impact of overseas investment and export expansion is also captured by a reversed U-shaped curve, with greater impact for the former. Fourth, an asymmetric grin curve rather than a smile curve is found in Taiwan’s manufacturers, whose value creation can be strengthened by strategies that focus on the learning curve, internationalization, internet, operating scale, and capital intensity. R. N. Lussier, “A nonfinancial business success versus failure prediction model for young firms,” Journal of Small Business Management, vol. 33, no. 1, pp. 8-20, 1995. P. Marco, P. Fabio, and Z. Luigi, “Why do companies go public,” The Journal of Finance, vol. 53, no. 1, pp. 27-64, February 1998. I. Erel, Y. Jang, and M. S. Weisbach, “Do acquisitions relieve target firm’s financial constraints,” Journal of Finance, vol. 70, no. 1, pp. 289-328, 2015. E. Maine, S. Lubik, and E. Garnsey, “Value creation strategies for science-based business: a study of advanced materials ventures,” Innovation: Management, vol. 15, no. 1, pp. 35-51, December 2014. T. J. Chemmanur, E. Loutskina, and X. Tian, “Corporate venture capital, value creation, and innovation,” The Review of Financial Studies, vol. 27, no. 8, pp. 2434-2473, August 2014. Y. Yang, V. Narayanan, and D. De Carolis, “The relationship between portfolio diversification and firm value: the evidence from corporate venture capital activity,” Strategic Management Journal, vol. 35, no. 13, pp. 1993-2011, December 2014. J. M. Quentier, “Self-employment start-ups and value creation: an empirical analysis of German micro data,” Advances in Competitiveness Research, vol. 20, no. 1-2, pp. 37-57, 2012. M. V. Posner, “International trade and technical change,” Oxford Economic papers, vol. 13, no. 3, pp. 323-341, 1961. P. R. Krugman, “Increasing returns, imperfect competition, and international trade,” Journal of International Economics, vol. 9, no. 4, pp. 467-479, 1979. K. Lancaster, “Intra-industry trade under perfect monopolistic competition,” Journal of International Economics, vol. 10, no. 2, pp. 151-175, May 1980. J. H. Dunning, “Toward an eclectic theory of international production: some empirical test,” Journal of International Business Studies, vol. 11, no. 1, pp. 9-31, 1980. J. Wagner, “Exports, firm size and firm dynamics,” Small Business Economics, vol. 7, no. 1, pp. 29-39, February 1995. A. Bhide, The origin and evolution of new business. New York: Oxford University Press, 2000. S. A. Zahra, R. D. Ireland, and M. A. Hill, “International expansion by performance,” Academy of Management Journal, vol. 43, no. 5, pp. 925-950, 2000. H. C. Kuo and Y. Li, “A dynamic decision model of SME’s FDI,” Small Business Economics, vol. 20, no. 3, pp. 219-231, May 2003. K. Head and J. Ries, “FDI as an outcome of the market for corporate control: theory and evidence,” Journal of International Economics, vol. 74, no. 1, pp. 2-20, January 2008. K. M. Hmieleski and R. A. Baron, “Entrepreneurs’ optimism and new venture performance: a social cognitive perspective,” The Academy of Management Review, vol. 52, no. 3, pp. 473-488, 2009. N. Kumar and N. S. Siddharthan, “Technology, firm size and export behavior in developing countries: the case of Indian enterprises,” Journal of Development Studies, vol. 31, no. 2, pp. 289-309, December 1994. A. Chen, “Taiwan’s paradigm shift: industrial engineers are shaping a nation,” Industrial Engineer, vol. 40, no. 10, pp. 31-34, October 2008. 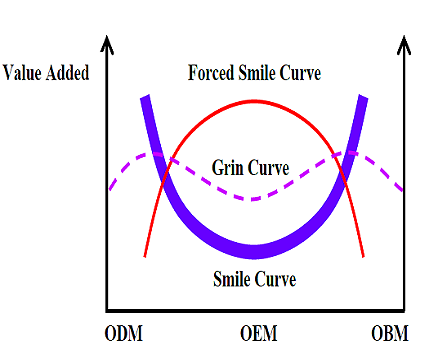 E. Lundquist, “Shih’s curve can bring smiles,” eWeek, vol. 56, September 2007. F. J. Lin, “The determinants of foreign direct investment in China: the case of Taiwanese firms in the IT industry,” Journal of Business Research, vol. 63, no. 5, pp. 479-485, May 2010. J. R. Lin, C. J. Huang, and C. H. Hsieh, “Internationalization, domestic employment, and overstatement of export contribution,” Taipei Economic Inquiry, vol. 51, no. 1, pp. 135-169, 2015. J.-R. Lin, C.-J. Huang, C.-Y. Chen, H.-L. Shiau, and Y.-C. Yeh, “New Ventures, Internationalization, and Asymmetric Grin Curve: Analysis of Taiwan’s Big Data”, AITI, vol. 4, no. 1, pp. 44-57, Jan. 2019.